Dr. Porter graduated from the SUNY Buffalo School of Medicine and BioMedical Sciences in 2000. 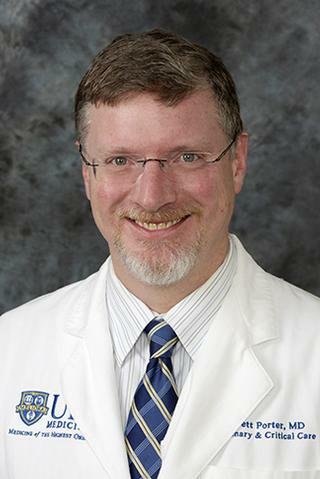 He completed his residency in Internal Medicine in 2000, and further trained at the University of Pittsburgh Medical Center as a Pulmonary and Critical Care Medicine Fellow. He is board certified in Internal Medicine, Pulmonary Medicine, and Critical Care Medicine. He has been on faculty at the University of Rochester since 2006. Dr. Porter is interested in the clinical management and the pathogenesis of Idiopathic Pulmonary Fibrosis (IPF). IPF is an incurable and invariably fatal illness, in which lung fibroblast-to-myofibroblast transformation and the pathologic development of fibroblast foci are believed to play critical roles. Myofibroblasts are believed to be the specialized cells responsible for collagen formation and the fibrotic destruction of alveolar lung units. The presence and numbers of fibroblast foci have been directly correlated with mortality in IPF. He is currently a recipient of a CTSI pilot proposal grant investigating novel cell-cell interactions responsible for myofibroblast activation, as well as attempting to identify novel biomarkers which can be used to monitor disease progression and response to therapy. He is a previous recipient of a Kirchenstein NRSA grant investigating the role of Heat Shock Protein 70 as an anti-inflammatory agent in preventing myofibroblast activation. Endrizzi J, Nobay F, Wiegand T, Porter E. "Bronchoscopic Findings Associated with Inhaled Chlorine Toxicity. Endrizzi J, Nobay F, Wiegand T, Porter E." J Emerg Med. 2015; 15: S0736-4679.